I bought a mandoline recently and am now embarrassed that I ever tried making chips or crisps without one. Although dangerous to fingers, this is made up for by the fact that it slices each vegetable in seconds. Really, seconds. I’ve been having a great time all week slicing veggies into colourful wafers and ribbons, so expect to see more of these in my recipes! 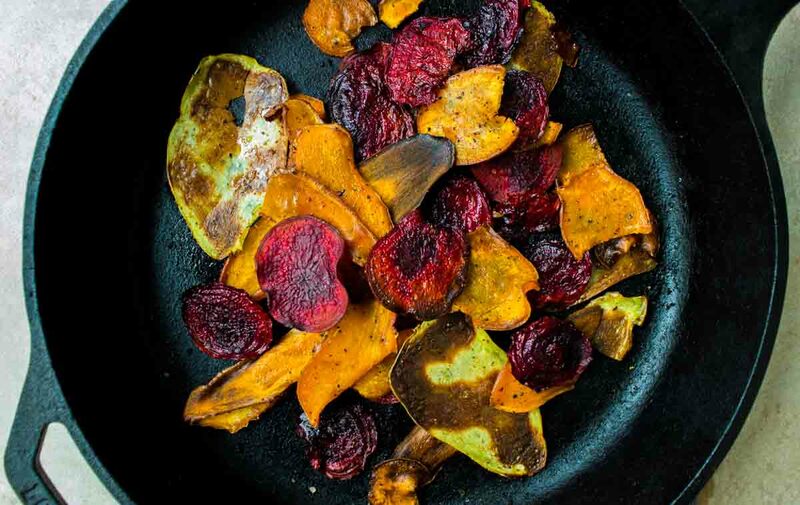 But for now, let me share a simple recipe for these cosy root vegetable chips. There is something so satisfying about making your own chips. Not only can you cut down on a lot of the salt and fat in store-bought ones, but you can really experiment with the flavours. Cayenne pepper and chilli combine here to add spice, offset by the naturally sweet flavour of the veggies. One note – a mandoline really is quite necessary for this recipe. You are welcome to try slicing your vegetables with a knife but it is so much more time-consuming. In addition, it’s really difficult to get a wafer-thin slice from a knife. Be warned! You can play with whichever flavour combinations you’d like here – apple cider vinegar and sea salt is a particularly interesting one! Preheat the oven to 350°F/175°C. Using a mandoline, slice the potato, yam and beet into wafer-thin strips. Place into a large mixing bowl with the salt, pepper, chilli powder and oil. Mix by hand thoroughly until all slices are coated in the mixture. Spread the slices on pre-oiled baking trays (as many as you need), ensuring none are overlapping, and bake in the oven for two minutes. Take them out, flip the slices over and bake for another minute until they are just starting to brown. You really have to be careful here to catch them before they burn as it happens very quickly! Remove from the oven and allow the chips to cool and harden on the trays for several minutes. Place in a bowl and enjoy.